In the late summer of 2013 Ellis Pond experienced an intense, but brief, localized algae bloom. In 2014, a steering committee formed and organized a watershed survey of the direct watershed. Surveyors identified 183 non-point source pollution (NPS) sites during the Ellis (Roxbury) Pond Watershed Survey. In 2015 Ellis Pond Watershed-based Protection Plan was completed and the Ellis Pond Watershed Committee enlisted the help of the District to apply for funding to address the sites identified in the watershed survey. A project proposal received approval for funding through the Maine DEP and this spring the District, in partnership with the Town of Roxbury, Androscoggin River Watershed Council and several local watershed groups, began a 2 year NPS remediation project, funded in large part through a DEP 319 grant funded by the Clean Water Act. 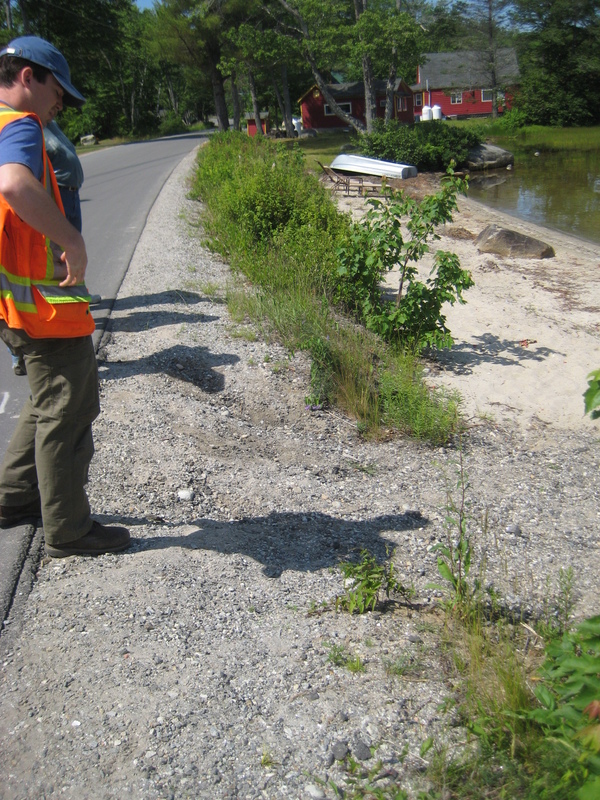 The Ellis Pond Watershed Protection Project provides free technical assistance to property owners in the Ellis Pond watershed and residential matching grants up to $350 to residents that follow through with technical assistance recommendations that decrease erosion and sedimentation. Also included in the project is cost-share funding to the Town of Roxbury to remediate town road and property sites that are experiencing significant erosion problems. Education and outreach are another component of the project with plans to erect a Kiosk near the pond that will highlight ways in which the town and property owners can help protect the water quality of Ellis Pond, as well as public meetings and workshops on topics such as maintaining ATV trails to prevent erosion and planting vegetation along waterfront areas to help filter phosphorous, a great contributor to algae blooms. This summer was the first year of the project. It began with a postcard mailing and local newspaper articles about the project. By the end of the October we had reached many of the first year goals. We were able to conduct 12 technical assistance site visits and 3 property owners of those are following through with recommendations made to take advantage of residential matching grants. The Town of Roxbury had, since the watershed survey, already begun addressing some undersized culverts and eroding ditches on town roads and with the additional funding to continue with more work have agreed to complete 5 road more improvement sites this fall. Other sites that will be addressed include several tributary streams, which during big rainfall events are experiencing severe bank erosion and depositing sediment plumes into the pond. ATV trails and logging roads that are in need of “best management practices” (BMPs) to help divert runoff are also on the list of sites to be remediated. This project would not be possible but for the dedicated efforts of the Ellis Pond Watershed Committee. We look forward to continuing this project through next year. Oxford County SWCD leads numerous conservation projects throughout Oxford County. We also provide technical assistance on projects led by other SWCD’s and natural resource agencies. Some of these are grant funded projects and include: Lake or stream watershed surveys, fish barrier/culvert assessments, conservation education projects, erosion control “Best Management Practice (BMP)” implementation, and many others. We work with local property owners, municipalities, and concerned citizen groups to bring solutions to local conservation problems.